I imagine that every person who chose education as a career has a teacher in the past who was a positive influence. I’ve written about favorite teachers before, but as I sit here contemplating those individuals, again, I can’t narrow it down to one. In elementary school, Barb Ihnen was my third and fourth-grade teacher. We adored her. She made her classroom and learning fun. It was even differentiated back then (though I didn’t know that term), and some was self-paced. I was so excited when I found out she was changing positions and would be my fourth grade teacher, as well. Just this past fall, I was blessed to work with Barb again, this time with her as my mentor in my principal’s licensing program. She is still an innovative and outstanding educator, now as a principal in an elementary school. In junior high, I was in an advanced math class. That meant that I took eighth-grade math in seventh-grade, and Algebra the following year. In my small school, I had Mr. Bud Tully for both years. He was getting close to retirement age when I was there, but he still loved his job. You could just tell. He was friendly, happy, and patient every day – not an easy thing when you deal with seventh- and eighth-graders all day. He would often give up his prep period to work with my friend and I if we were confused on homework assignments. He never made us feel like we were a burden, but welcomed us in any time we needed help. I had a handful of teachers then between high school and college whom I appreciated. None had the impact on me that my younger years’ teachers did. This may have been the reason I was driven towards elementary teaching as my career choice. Another teacher in my life may have influenced that choice, as well. My mother was a kindergarten teacher for over forty years. She was excellent in the classroom, and in the home. She showed me what a working mother could accomplish, and she did it well. I couldn’t have asked for a better model as a parent, or as a professional. I have had times throughout my career when I have wondered, “What if…” I had chosen a different career path. But the bottom line is, I care about kids, and I care about the educational system. I’m proud to be in education, and thankful for those who have taught me along the way. 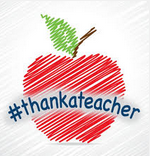 Have you thanked a teacher today? This entry was posted in Education and tagged relationships, teaching. Bookmark the permalink. There are some exceptional teachers around and my exceptional teacher is Mrs. Learner Sudlow…still in touch with her!